On the road, many drivers and their passengers love to listen to music. For quality sound you need to install not only the radio and speakers, but the subwoofer is connected via the amplifier. However, very often the problem arises to connect, as not every radio has the connectors to connect the amplifier and subwoofer. Carefully read the instructions that came with your radio. If you lost it, go to the official website of the manufacturer of your head unit, find the model and download the manual for it. Look on the manufacturer's website or in the instruction diagram and the Pinout of your radio. Then visit the forum dedicated to your model of radio. Probably someone before you tried to connect to this head unit, subwoofer or amplifier and shared the experience with their friends. Remember that all intervention in the structure of the radio automatically deprive you of factory and shop warranty. If you don't want to spend a lot of time and effort, it is possible the signal from radio apply directly to the speakers and the amplifier. However, there is one point. 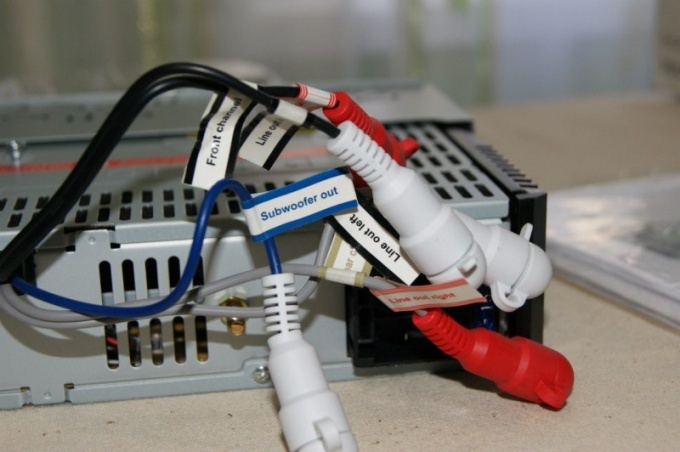 With regular connectors of the receiver is already amplified signal, so you need to install a special adapter. Look on the forum the model of the adapter or ask the seller-adviser in shop of car audio. This adapter should provide a balancing force signal from the radio, with the power of the signal which passes through amplifier and subwoofer. Remember that without connecting this adapter you risk burning out the line outputs of the radio. Give your radio to feed separate outputs for a subwoofer and amplifier if you want to achieve maximum sound quality. It is not recommended to perform this procedure yourself as you can due to the lack of experience to ruin the scheme of a radio. Connect to the connectors on the radio wire from the subwoofer and amplifier. Check out the care connection. Route the leads so that they not only will not interfere with use of the car, but did not periklis any items or doors. Carefully fasten the housings of the amplifier and the subwoofer. Make the first switch of the audio system and check that no parts are vibrated and did not produce any sounds.